TECMAT®: Protects slopes from erosion for successful revegetation. TECMAT® erosion control mat, with its irregular loop structure, made from environmentally friendly polypropylene, is specially adapted for utilization with the TECCO® System. The flexible, three-dimensional erosion control mat is installed together with the TECCO® mesh and serves as an underlay. 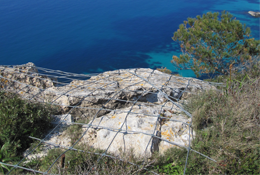 The TECCO® mesh is laid over TECMAT® and anchored to the slope with soil or rock nails. In this way the matting is pressed to the profile of the slope. The irregular, open three-dimensional structure is very flexible and therefore fits snugly to the slope. TECMAT® works well with sprayed seeding applications. Slopes stabilized with TECCO® System and protected with TECMAT® fit harmoniously into the landscape after the recovery of the vegetation and thus improve the environment.